I was on my way to finding something else when I happened to run into this little news item. I thought you should see it. Heck, the record probably still stands. You know those drumlins I’m always on about? And the ridges? Between here and Petoskey it’s all drumlins and ridges unless you’re in a boat. 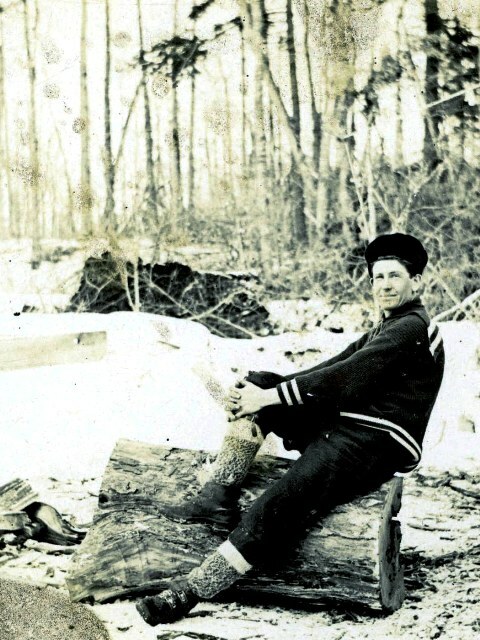 But Ray was a strapping 28 year old logger and teamster with sturdy legs. He was a forward-looking guy, and loved a challenge. “Wheels” were just the ticket. Ray probably bought his wheel from Norton Pearl and Charley Smith’s bicycle shop. I suspect Norton, a PR guy before anyone knew what that was, talked Ray into his 150-mile ride to get some buzz going. 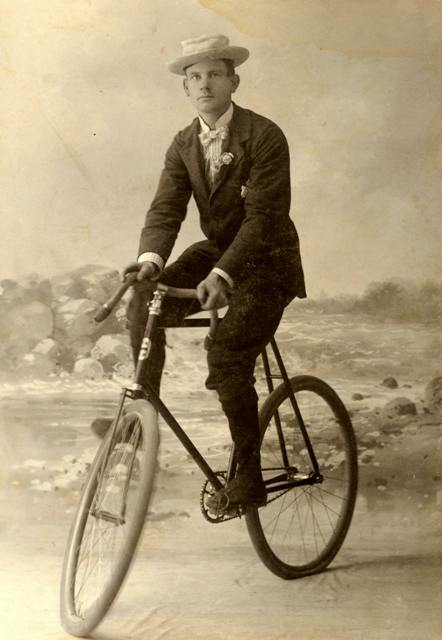 Charley perched on a bicycle in a straw boater and a bow tie for the studio publicity photo. A born salesman. 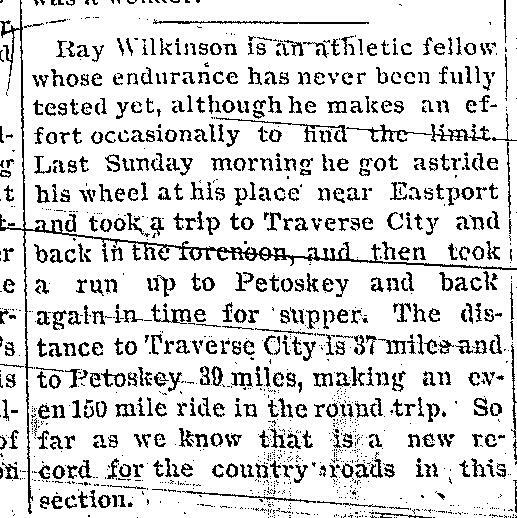 No picture of Ray high-tailing it over the drumlins on his way to Petoskey. Charley was dapper, but Ray was a good-looking guy himself, and excellent husband material besides. In 1899 he married Hattie Cross Blakely, the widow of George Blakely, and settled down as a Family Man with Responsibilities. 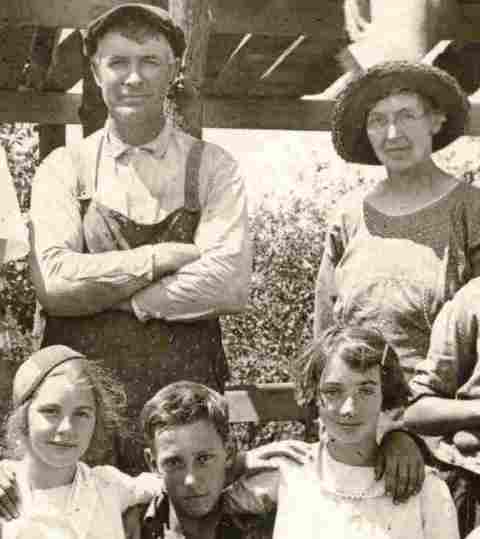 Here they are on a cherry picking crew in 1922. I know, I know. 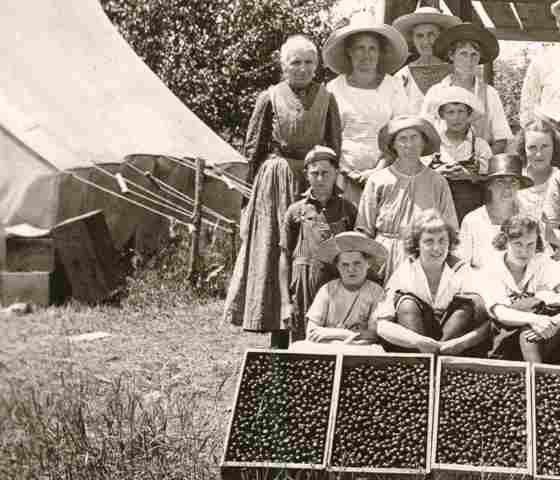 I’ll show you the closeup in a little minute, but just take a look at the context—the lugs of gleaming cherries, the tent, the tired faces under the funky assortment of hats. Look at the range of people working that hard. That’s Hannah Curren over there on the left, and she was 70. Maybe she wasn’t picking. 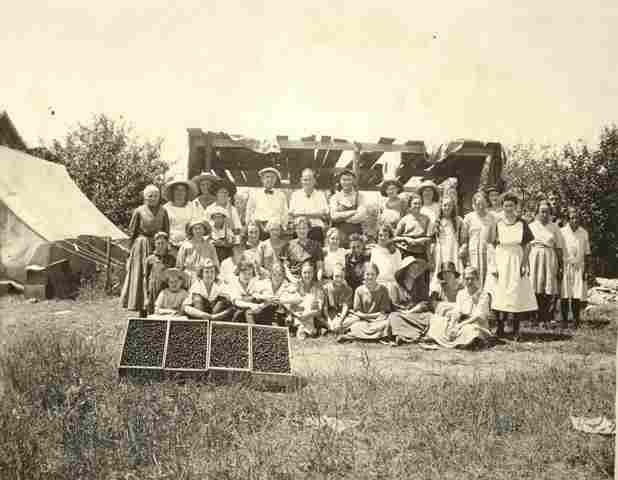 Maybe she was washing cherries or cooking for the pickers. Tell you what, though, that woman could work. They all could. Puts me to shame. OK, OK, here’s the closeup of Ray and Hattie. Can you see the little polka dots on his overalls? Makes you wonder if they were recycled from something else, doesn’t it? Ray lived a good long time in the house in Eastport. After Hattie died in 1938 he didn’t see much sense in fluffing things up. He heated and cooked with wood, kept the hand pump in the sink and the privy in the back yard. But he was still a forward-looking guy. In 1962 he was down in Traverse City getting on a plane to visit his grandson in California when his heart quit and he died. Just like that. Just an everyday kind of guy, Ray. He would be surprised that his house became the Wilkinson Homestead Historical Museum. I think he’d like it, though. It tells a little bit of his story, a little bit of ours. Maybe even issues a little bit of a challenge. Want to go for a bike ride? I’ll obviously have to start taking cycling seriously. Opportunities for cherry picking are limited here though. Ha! You take cycling every bit as seriously as Ray Wilkinson did and over higher hills. When I found the article I thought of you, and of my brother-in-law, Dennis, who made a coast to coast ride to celebrate his 50th birthday. Um, not west coast of Michigan to east coast of Michigan, but Pacific to Atlantic. Not all on one day, mind you. I love to read about OTHER people setting records for athletic endurance. This one was better than many, because the feat was accomplished over 100 years ago. Love all the pictures, Gerry, as well as the little news article introducing your topic of the day. This was a fine story! I’m glad you liked it. I’m practicing listening to people who are from Then. One day I’ll figure out how to tell their stories to people who are from Around Now. It’s very absorbing. Oh Gerry, we all want to be remembered when we’re gone. On behalf of Ray, I thank you for telling his tale. We do, but I think Ray was fine with being remembered by the people who knew him. He was, too, and is. There are plenty of people in the Township who remember Ray as he was in the 1950s – still a big, strong guy who could turn a hand to many useful things. I think this is my favorite post of all I’ve read here. The parallels between these people, the “old folks” I’ve known in Texas and many of the Cajuns in Louisiana are just so strong. It’s clearly not a geographic thing, but a time thing: knowing how to work. Knowing how to adapt. Taking pride in their own achievements, and in each other. We need to hear their stories. I’m just so touched. I love the photos. I love seeing Hannah Curren over there, still working at 70. I think I’ll still be working at 70. It’s nice to see others who did – or do. I mean – cruise ships are nice and all, but really…. I believe I’ll go have a spoonful of my Petosky cherries in their honor. I like to think of the Great Lakes region as unassimilated, unincorporated and unsalted. Between the cherries and pasta shaped like R2D2 I’m getting hungry.